Welcome, faithful readers (and those of you joining us for the first time) to the 115th installment of Cover Stories, the weekly column in which I, Jon B. Knutson, present a group of covers with a common theme! This week's theme is a bit of a departure for Cover Stories, but like the previous ones, it's spun out of a series of posts I've made on the DC History list (which you can sign up for at http://groups.yahoo.com/group/DChistory - I'm one of the moderators on that mailing list, so spam is kept to a minimum). This theme is "TV Comics!" There have been a lot of comic books based on TV shows, especially cartoons (although not all the hit shows spawned comic book adaptations, as I've shown a few times with "Comics They Never Made"). Most of them came from companies like Dell and Gold Key, but Charlton also did quite a few, and there were even some from DC, Marvel, and a few other publishers here and there! On DC History (which, as you may have guessed, doesn't just focus on DC comics), I was posting these covers usually in sets of 10 or less per day, depending on how many issues there were... but just to whet your appetite, I'll typically present one from each series. You are, of course, more than welcome to go to the Grand Comics Database (at http://www.comics.org) to sample other covers, and I'd like to take the opportunity to thank the GCD for the covers I'm using here and in other columns! This time around, we're looking at some "A"-titled books! Abbott and Costello, as some of you older CS readers may be aware, had a long and successful career, starting out in the latter days of vaudeville, and going on to radio, movies (my favorite of theirs is "Abbott and Costello Meet Frankenstein," in which they not only meet the Monster, but also Dracula and the Wolf Man) and television. Even if you don't know them by name, you probably have heard their famous "Who's On First?" routine, which I understand was actually originated by another comedy team, but A&C definitely made it theirs, performing it on stage, on their radio show, and on their TV show (one episode of the TV show with the routine is available for purchase on DVD... for a buck! Check your local dollar stores). Their first stage appearance was in 1935, at the Eltinge burlesque theater in New York, and they made their partnership formal in 1936. They debuted "Who's on First?" for radio on "The Kate Smith Show," and stayed on as regulars for two years. They also appeared in a Broadway review in 1939. Their first film appearance was in 1940's "One Night in the Tropics," which also featured "Who's On First?". "Buck Privates" (1941) was their first movie to themselves, and they made over 30 other films until 1956. Their radio show started in 1942 on NBC, and five years later switched to ABC. They were part of the rotating hosts of "The Colgate Comedy Hour" on TV in 1951, finally getting their own TV show in 1952, which ran until 1954 before going into syndication. 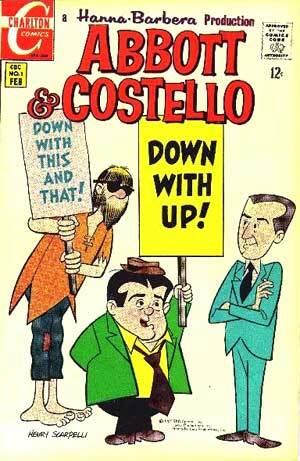 The duo first appeared in comics form in "Abbott and Costello Comics" in 1948, published for 40 issues by St. John. In 1953, a one-shot 3-D book was also produced by St. John, and in the 1950s, there was a Canadian one-shot book by Derby Publishing, which I suspect was a reprint of one of the St. John issues. Some of those St. John stories can be found in the 1989 Malibu comic "Abbott and Costello: The Classic Years," but I've never seen a copy! And now we come up to the series that sparked this TV comic! In 1966, Bud Abbott voiced his character in a series of 156 five-minute cartoons made by Hanna-Barbera, with Lou Costello voiced by Stan Irwin. These cartoons were syndicated to various stations, often combined with other Hanna-Barbera cartoon shorts, and hosted by local kid's show personalities. This Charlton cover is very much on-model for the cartoon, and I have to say that I like the gag on Lou's sign. This series is definitely worth checking out the other covers for (there's a great one with the duo on the cover of the wrong comic!). This comic book adaptation lasted for 22 issues, cover-dated February 1968 to August 1971. Thanks to Wikipedia (http://www.wikipedia.com) for the background information on Bud and Lou! 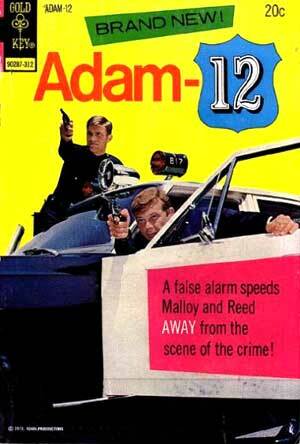 Adam-12 was, as you can see, a live-action TV cop series adapted to comics by Gold Key. This cop show ran from 1968 until 1975 on NBC, and focused on Los Angeles police officers Pete Malloy and Jim Reed. The show was produced by Jack Webb, who also created Dragnet and Emergency! (the latter series was also made into a TV comic, but strangely, Dragnet never was) The show's considered a spin-off of Dragnet, as the characters had appeared in episodes of the parent show. There were 175 episodes of this half-hour program. The comic book itself lasted ten issues, and from the one or two issues I've read, were fairly faithful to the show! Again, I have to thank Wikipedia for information on Adam-12! Sadly, creator credits on the comic are not to be found. Now, for something creepy, kooky, mysterious and spooky! Here's Gold Key's Addams Family comic book, and unlike the one I presented way back a whole bunch of Cover Stories ago, based on the live-action series, this was based, obviously, on the Hanna-Barbera cartoon adaptation! Yes, that's right... this was an adaptation of an adaptation (of an adaptation?). The original cartoons appeared in the New Yorker starting in 1937, and inspired the live-action TV series which aired from 1964-1966. In 1972, the Addams Family (as they appeared on this cover) guest-starred in "The New Scooby-Doo Movies," the latest iteration of the Scooby franchise, in which the gang met up with famous characters and actual celebrities in animated form to solve mysteries. Apparently, ratings were good on this episode, and the Addams clan got their own NBC show starting in 1973. The show only lasted for 13 episodes. As you may have guessed, the characters were designed to match their single-panel cartoon counterparts, rather than the live-action TV series. 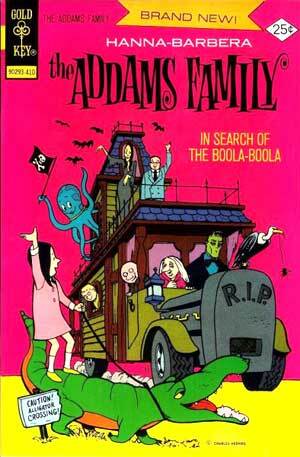 The show had the Addams clan traveling the country in their Victorian mansion-like car and getting into adventures. The comic (at least, the one issue I've read) didn't quite follow the same format, but it was close enough for the all of three issues that were published. The cartoon's voices were done by Lennie Weintrib (Gomez) and Janet Waldo (Morticia). Janet Waldo is probably best known for playing Judy Jetson! Jackie Coogan and Ted Cassidy reprised their TV roles of Uncle Fester and Lurch, and a young Jodie Foster voiced Pugsley! Cindy Henderson voiced Wednesday. The Internet Movie Database (http://www.imdb.com) also lists that Ken Weatherwax voiced Pugsley, but I'm not sure whether to believe that or not. No credits are to be found for the comic, although I'd almost have to guess that Mark Evanier may have written at least an issue of it (I know he did The Amazing Chan and the Chan Clan!). Thanks go to the IMDB and Don Markstein's Toonopedia (http://www.toonopedia.com) for information on the animated Addamses! Moving even further backward, here's another animated adaptation! The voice for the Witch Doctor's "Ooo-Eee-Ooo-Ah-Ah, Ting-Tang-Walla-Walla-Bing-Bang" was, of course, sped up for the record, and as a follow-up, Bagdasarian tried to figure out what kind of animal voices were suggested by that sped-up voice. Supposedly, his children suggested chipmunks (but I'd imagine that Disney's Chip 'n Dale had to be a factor here, as they sound like the same kind of voice process was used). Ross named his chipmunks after Liberty Records executives Si Waronker, Ted Keep, and Al Bennet, giving the world Simon, Theodore and Alvin. Apparently, the executives personalities were transposed to their Chipmunk namesakes. "The Chipmunk Song" (aka "Christmas, Don't be Late") was released in time for the holidays in 1958, and was a smash. Follow-up records came out in 1959, and Dell Comics first brought Alvin and the Gang to comics in 1959, in issue 1042 of Four Color Comics - although the Chipmunks looked more like real chipmunks than the versions you see above! 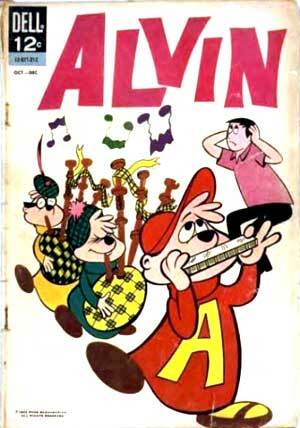 "The Alvin Show" debuted in 1961 on CBS, and that's the version the above comic is based on. Ross continued to do the voices for "David Seville" and the Chipmunks for the cartoon. The show only lasted one season in prime time, but was rerun the next year on Saturday mornings. The comic book started in 1962, and ran for 28 issues. There were also a few one-shots here and there, including "Alvin for President." Some of you younger readers probably don't recall the original Alvin show... although it was re-run in 1979 by NBC, about seven years after Ross Bagdasarian passed away. In 1980 or so, a disc jockey's joke about an album called "Chipmunk Punk" led to Ross' son, Ross Bagdasarian, Jr. to actually produce an album of that name, and a new series, "Alvin & The Chipmunks," debuted on NBC in 1983. This series lasted until 1981, and even inspired Harvey Comics to reprint five of the Dell Comics issues in 1992! Since then, the Chipmunks have only appeared in a few straight-to-video animated features. Anyway, back to the comics... unfortunately, as is the case for most TV comics, there's no creator credits available! So, that's the four TV comics for this time around... once again, I'd like to thank the Internet Movie Database, the Grand Comics Database, Wikipedia, and Toonopedia for their invaluable help in providing details to go in this column, which I think took me longer to write than any three columns to date!